Diet management for German Shepherd puppy is one of the trickiest dispositions. Whatever good and nutritious for you and your kid may not be enough for your dog, or at times may also be harmful for them. Making food for your GSD at home can be a real fun and a big responsibility at the same time. Good nutrition is always more than important during his growth period. Diet management for your puppy doesn’t only mean giving him the right kind of food with right percentage of fats, proteins, carbohydrates, minerals and vitamins, but it also mean feeding him right quantity of food at the right time. The most common mistake noticed in many dog owners – especially in newbie is a tendency of overfeeding, which may be detrimental for your growing puppy. It is rather wise to invest time on planning a healthy feeding routine for your pup. Rather than feeding in bigger volumes, it is advisable to break your puppy’s food into 5 to 6 feeds a day and gradually decreasing the feeding frequency and increasing the volume as he grows. What Should Your puppy’s Food Contain? Keep a close eye on your puppy’s health condition and growth rate. Remember a fast growing puppy gives you an indication of impending anatomic problems. Promoting optimal health starts with giving him the right kind of diet that is well balanced, at right quantity. 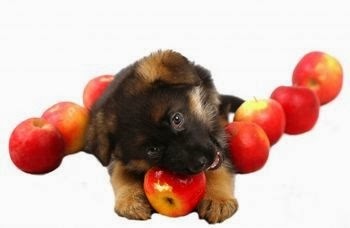 A balanced diet may promote good growth in your German Shepherd puppy. Let’s think of it a bit different way. Instead of feeding your puppy those so-called ‘puppy food that are available in the pet stores, let’s plan your puppy food that will promote optimal growth and build strong immune system. Well balanced diet with all necessary nutritional factors can be prepared at home with right quantity of fat, protein, carbohydrate and minerals. Planning a diet with very high protein to promote excessive growth is not a wise decision. However, planning a low protein diet for your puppy is not wise either. The base of your puppy’s food can be chicken and vegetables, which are readily available and not much expensive as well. Fresh chicken, eggs, cheese, fruits and vegetables (not all types of veggies and fruits are permissible though) are a great source for carbohydrates, fats, minerals, proteins and vitamins that are required for your puppy’s growth. Organ meats are simply as nutritional in your GSD’s diet as the muscle meat itself. Organs like heart, brain and eyes are concentrated source of taurine – an essential amino acid that forms the main constituents of all proteins. Hence this promotes good growth. However, muscle meat also has taurine, but just not enough as in the organ meat. By planning home made diet with components like fresh meat, necks, heart, liver and brains you already make sure that your puppy is getting enough of essential nutrients and growth promoting amino acids. Please Note: Although organ meats are a nutrient dense food and good for your GSD puppy, but too much of it is not recommended. 10% to 15% of heart and liver with 80% of other types of meat each day is a good combination or 20% to 25% every alternative day may be nice as well. Fruits and vegetables are rich source of antioxidants and reduce the risk of cancer in dogs, though not all can be included to his diet chart. Just like fruits and vegetables are good for us humans, they are also highly effective to promote a healthy life of your dogs. Fruits like orange, banana, apples, watermelons, guavas, mango, papaya, cucumber, cantaloupe, cranberries are mini powerhouses of antioxidants and are great for your dog’s internal health. Vegetables like carrots, broccoli, green beans, pumpkin, sweet potatoes, spinach, bottle gourd, ladies finger are a great addition to your dog’s daily diet. Cooking and steaming these veggies will break down the cellulose walls, making them easily digestible for your GSD puppy. Apart from lycopene, tomatoes also contain concentrated vitamins A and C. Occasional inclusion of tomatoes in your puppy’s food may be a good decision. However, if your dog may develop acidity, you should consider stopping tomatoes in his food.